Really nice shoe. Very comfortable. True to size. Am ordering another pair. I like these shoes for slipping on and off easily. They are a bit too wide, but work for what I want to use them for. The elastic is stretchy. When you walk, it's more like flip flops, flicking up and down. I don't mind that, but the width was loose. The right foot (which is my larger foot) was definitely looser than the left, too. So cute, but not a keeper for me. I'm returning these. They are comfortable, but too stretchy. I fear that when walking a lot in warmer weather my feet would slide all the way through. I have sort of wide feet, so I was surprised at this. 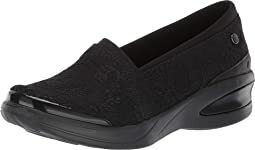 I'll try another Bzees shoe, because they are so comfortable, but these won't work. I have foot problems and these are very comfortable. I get no pressure points from these. I was worried that the stretchy fabric would make them feel unstable but they are fine. These shoes are like walking on clouds! I returned the silver, but only because the silver was way too shiny for my taste. But the other two are beautiful and comfortable! (gold and brown). Not for use without socks. I got the "multi blue art print" color, and I really liked the way the shoes looked online but when I got them on my feet, in person, I didn't like the way they looked. The color seemed to be much lighter than it looked on the screen, and it wasn't working for me. There was nothing wrong with the fit, but I had to return them. I first ordered these in an 8 wide (my usual size for shoes). I thought the fit was short so I sent them back for the 81/2 wide. Those went back, too, for the next size up. The 9 wide fit perfectly. Thanks to Zappos, the shipping was free and returns easy. This shoe, though really cute, just did not work for me - the sizing seems a bit off. I own the Bzees sneakers with ribbon laces - love those. I wear size 9M in those, and they are incredibly comfortable, even when you are walking miles at a time. But size 9M in these were too long for me - my feet were coming out of the shoes at the back when walking. Then I ordered a size 8.5M, and this time it was not too long - but the fit still did not feel right. It felt a bit narrower than I liked, and I felt like the arch support was not hitting me at the right spot. 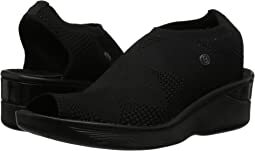 I love Bzees' arch support - that's part of the reason i love this brand, and my feet tend to hurt when there is not enough of it. So I ended up returning both pairs. I like the look of these, but it made of a stretchy material that causes the shoes to snap like a flip flop. Not supported well on the foot. I was hoping these would be great for work, but alas, the flip flopping and associated instability is too much to make these really useful aside from standing at a bar or sitting at a restaurant. I use these shoes as house shoes. They provide enough cushion to help save my knees and back from walking on my tile floors. I'm unsure if I will wear them outside of my house. These sandals are super fun and comfortable. I ordered my size, 8.5 W, and the fit is perfect. Like the color and the shoe was very comfortable. It was just too clunky looking for me. Love these shoes! I ordered my usual size, 7.5, and they fit OK first time I tried them on. Next time I tried them I realized they were a bit too big. So I ordered the size 7 and like the fit better. Depending on the particular shoe, I wear a 7 or a 7.5 or even an 8. I am mostly on my feet for work, and these shoes are really comfortable all day long. I did have to order a half size up for the best fit. Wide with was too narrow and pinched across the toes. Poor arch support. Very disappointed as they are cute shoes. I wore this right out of the box and walked over 4 miles in the city the first day - it was super comfortable. 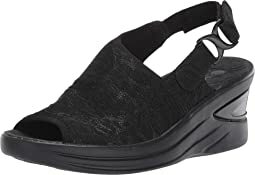 Very cushiony, has a bouncy feel due to air, and great arch support - and it's feather weight. This def has a girly design - I got the grayish one, and it has ribbon laces and sparkly finish. I don't mind - i think it's cute and adds character (i am in my 40s). 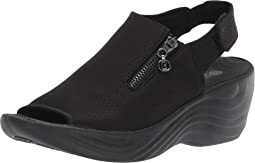 i have already ordered the black pair also - I was looking for comfortable options to walk the dog daily (we walk miles at a time), and this is going to be a great option for that, plus for casual use. I ordered my usual size 9 sneakers, and fits perfectly - surprisingly, it's as comfortable as my far more expensive brand name running sneakers, but a lot cuter and lighter. Hope it is durable as well and holds up for all our daily long walks. I wear an 8 or 8.5 depending on the shoe. This shoe was a long for my feet in the size 8.5, and honestly, I didn't care for the looks of the blue with rainbow strap once I saw it. I re-ordered in the 8 in black, and love it! I will return this one. The shoe was to smalll in the toe area for my foot. The shoe is very cute but did not fit me. LADIES!!! These are a must...IN EVERY COLOR!! They are so comfortable, like walking on marshmallows! There's great support and my feet feel very secure while walking. 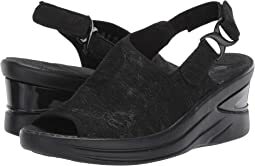 Being a major "flip" lover, these are such a nice, comfy, cute alternative. I know what I'll be wearing all summer and I've got my go-to shoe for my upcoming vacation! You won't be disappointed!